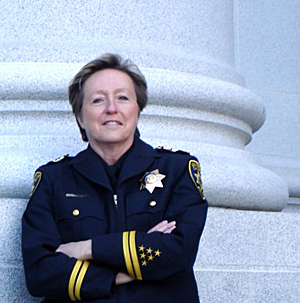 Margo Bennett, a University of California Police Department captain with more than 35 years of law enforcement experience that ranges from community policing work to expertise in investigating major crimes at the federal level, has been named UC Berkeley’s new police chief, campus officials announced today (Thursday, April 18). Bennett has been serving as interim police chief since Dec. 30, when the former chief, Mitch Celaya, retired. Bennett plans to work closely with students, faculty, staff and others to develop ties that will build relationships across campus. Such ties should lead to more individuals contacting the police department about crimes and suspicious activities, and working with the department to ensure that campus events can be handled through the cooperative engagement of all involved. Ron Coley, UC Berkeley’s associate vice chancellor for business and administrative services, led the nationwide search for a chief, which drew scores of candidates. To ensure that the campus had an inclusive process, finalists met with a wide cross-section of stakeholders, including faculty, students, police officers, administrators, staff and others. Each group provided detailed feedback used in the final selection decision. In order to map out the change agenda, Bennett has committed to meet with all of the stakeholder groups across campus and leaders of surrounding police agencies. Her goal is to hear about ideas and concepts that can lead to stronger relationships and improved results. Bennett’s policing career began at West Georgia University, where she obtained a bachelor’s degree in sociology/criminal justice and a master’s in counseling psychology. After earning her degrees, she rose to the level of lieutenant at WGU before moving on to the FBI, where she worked for more than a decade, developing expertise in training special agents in interview and interrogation techniques, hostage negotiations and other skills. She left the FBI for the Northern Virginia Community College Police Department, where she rose to the rank of police chief for the multi-campus educational institution, the nation’s second-largest community college. Bennett joined the UCPD as a captain in 2002, and has overseen or been involved in administrative and management matters including recruitment, selection and training of all UCPD personnel; development of UCPD policies; and oversight of community-service work including crime-prevention efforts, night-safety programs and residential security. Bennett, 59, will manage UCPD’s 149 employees, including 66 sworn officers. The department’s jurisdiction includes the central campus, as well as other UC-owned property such as Lawrence Berkeley National Laboratory, University Village in Albany and the Richmond Field Station.